London, The Hayward Gallery, Matisse, July-September 1968, p. 142, no. 121. Washington D.C., National Gallery of Art; The Detroit Institute of Arts; and The St. Louis Art Museum, Henri Matisse Paper Cut-Outs, September 1977-March 1978, p. 125, no. 58 (complete maquette illustrated). A photo-certificate from Marguerite Duthuit dated Paris, 23 April 1981 accompanies this cut-out. In 1946 London designer Zika Ascher asked Matisse to provide a design for a large decorative fabric hanging. At first Matisse was hesitant, but when Ascher returned to the artist's Paris apartment several months later, Matisse had covered the walls of a large room with cut-out designs, his first major composition using this technique. The subject was Ocanie, based on the artist's recollections of his trip to the South Seas in 1930. The individual cut-outs were sent to London where they were assembled into two maquettes, Ocanic, La ceil and Ocanic, La mer, from each of which an edition of thirty silkscreen prints on linen were produced. 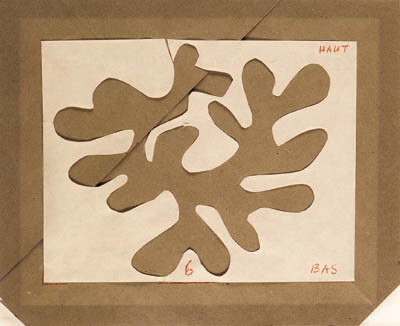 In the same year Matisse utilized the paper squares from which palm designs had been cut for a second Ascher commission, this time for a scarf. The design had one square in each corner of the scarf; two maquettes ("A" and "B") were made. From Maquette A an edition of 275 scarves were produced. Maquette B was later cut down into their component squares.